Sony Ericsson has announced two new phones, Xperia ray and Xperia active in India. 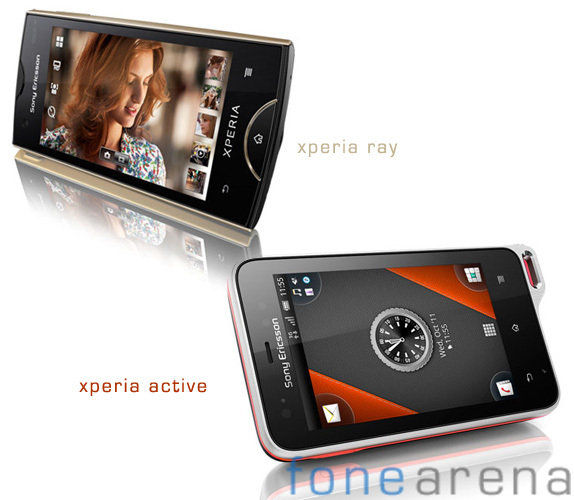 The Xperia ray is sleek phone and Xperia Active is sporty phone that is dust proof and water resistant. Both these phones run on Android 2.3 (Gingerbread) and features 1 GHz Qualcomm Snapdragon S2 processor. These phones were announced in CommunicAsia 2011 at Singapore. The Xperia ray is just 9.4mm thick and comes with 3.3 inch (854 x 480 pixels) Reality Display with Mobile BRAVIA Engine, 8MP Auto focus camera with Sony Exmor R CMOS sensor and offers 720p HD video recording. It has connectivity option like 3G, Bluetooth with A2DP, Wi-Fi and aGPS and has 1500mAh battery. The Xperia Active is dust proof and water resistant (up to 1m for 30 minutes) and comes with 3 inch (320 x 480 pixels) Reality Display with Mobile BRAVIA Engine, 5MP Auto focus camera with 720p HD video recording. It has connectivity option like 3G, Bluetooth with A2DP, Wi-Fi and aGPS and has 1200mAh battery. The Xperia ray comes in orange with white and orange with black colors and the Xperia active comes in black and gold colors. The Xperia ray is expected to be priced around Rs. 18,000 and the Xperia active is expected to be priced around Rs. 16,000. These phones are expected to be available in India by September end. [Update]: Flipkart has listed the Xperia ray at a price of Rs. 18,995, but it’s not available for pre-order yet and the expected availability of the phone is also not mentioned. [Update 2]: The Xperia ray is now available from Flipkart and Letsbuy. The Xperia active is available for pre-order from Flipkart.